Me: So.. how may COPs have you been to? AJ: 5. And they all come to me. (Lastrina, AJ and Kjell laughs). Me: Aha. And what was the crime? The last few days, aside from trying to participate in the “fun” side of COP such as COP20 opening reception hosted by the Peruvian government on Thursday, the Asian youth dinner that the Singapore youth team organised on Friday and the NGO party organised by CAN International on Saturday, I have been trying to spend time away from large groups of people and spend more time with myself. So, the past week I have been going out taking morning walks and down to the different parts of the coast, and these two nights, I have been to the Convergence Space. 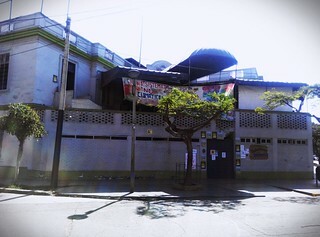 Casa de Convergencia TierrActiva (a.k.a TierrActiva Convergence Space) is an activist hub managed collectively by TierrActiva Peru and Bolivia with the support of Global Call for Climate Action. 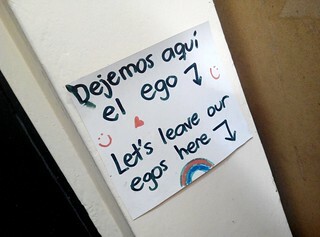 It is an independent, autonomous space, collaboratively created by dozens of local and foreign activists and artists. 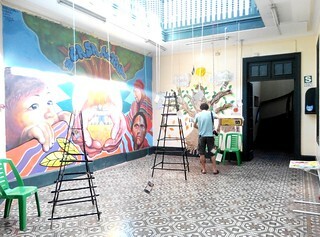 The space is open and can be used for meetings, workshops, presentations, discussions, making art, cultural events, and generally for bringing together and nurturing the movements for alternatives. You are welcome to use it for your informal meetings, presentations, trainings etc. While financial support for the space came mostly from the GCCA. Oxfam and CAN-LA have provided support for additional needs. Countless activists have supported with their creative energies and hard work. We operate under a philosophy of system change, not climate change. Beyond TierrActiva, several collectives are centrally involved in creating the space—including f.ex. 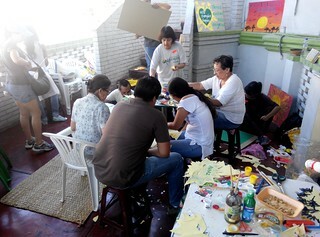 the Arts and Culture Commission of the People’s Summit. TierrActiva Bolivia is running a “conscientious food” kitchen on the spot. 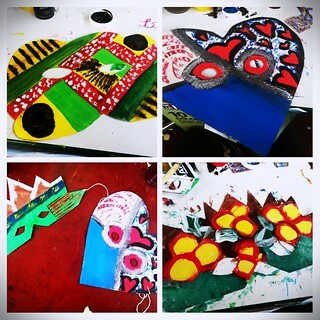 Yesterday, I dropped by and painted some 8 masks as my contribution to the People’s Summit March. 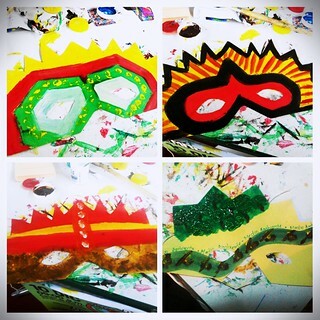 I was only satisfied with the first 4 masks to be honest. But anyway, I had fun. Tonight I dropped by again to attend a workshop on “Legal Strategies to Stop Extraction.” I have yet to digest that information and will be sharing that on a later post. 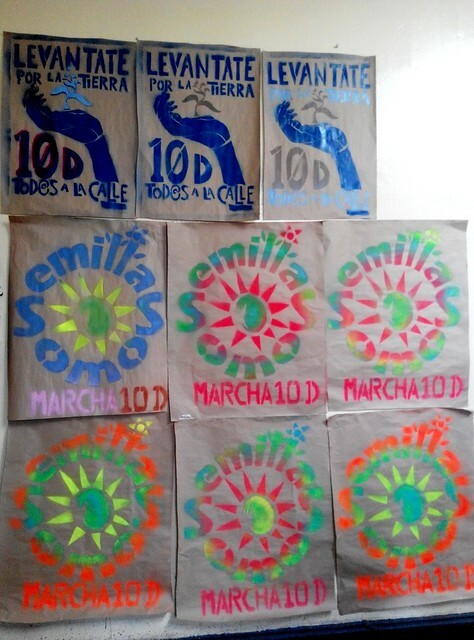 Back to the People’s Summit March..
Join us for the mobilization on the 10 December at 9:00am in Parque CAMPO DE MARTE, at the crossing of “Avenida de la Peruanidad”, 28 de Julio and Salaverry neighbourhood of Jesús María in Lima and in every other place where you are! The people will start to march around 11:00hrs. The 10th of December is the International Day of Human Rights and commemorates of the adoption of the Universal Declaration of Human Rights in 1948 by the United Nations General Assembly. It has been celebrated annually across the world since 1950 but this year it is up to social movements and not the States to show how the whole of humanity can participate in preserving and respecting their rights in a completely different way. Nevertheless this year the commemoration will tackle more than human rights: this year the world will mobilize to defend living systems’ right to last on this planet despite the predatory nature of capitalism, and try to remove the corporations’ influence in the climate negotiations. This year during the International Human Rights Day we invite you to come and defend YOUR rights, OUR rights and those of LIFE on Earth. This year we could have a major breakthrough in the negotiations that could lead to key agreements which would be decisive progress in containing the process of climate change which threatens survival on earth. Change the system not the climate! Stand up for the earth! The march will start at the Campo de Marte at 11:00am and will finish at Plaza San Martin, where the main lecture would start at 12:30hrs. To complete the whole lap, the march would take around 1:30 to 2:30 hours to complete the whole route. They are expected to have a lecture from President of Bolivia Mr Evo Morales, and thereafter people from the different groups will take the floor. I should be giving COP a miss on Wednesday morning to join in the march. If you’re around in Lima this Wednesday, do consider joining in the march. ← Subscribe to The Daily Tck!